We just got back from my village town yesterday for Chinese New Year celebration. We were there for 6 days. It is a tradition for us to get together with family members and friends during this festive season. One thing I never miss is I visit my grandpa’s house every Chinese New Year. Somehow I get these special feelings for it. Maybe due to the fact that I have been visiting it since I was very young, maybe 3 years old. The huge house is located in the middle of paddy fields. It is kind of a resort of its kind. Even though my grandparents had since passed away, this family get together is still alive and kicking… thanks to my uncles and aunts. Without them, this gathering wouldn’t have had happened. There are uncles and aunties, cousins… and now my cousins’ children – the forth generation of the family. Besides talking, we have lunch together. This is not the most luxurious meal in our life but it is the most authentic as it is prepared with love and tender. It is the best home-cooked Chinese cuisine I ever have. It also brings back my memory when I was a small child. I can still remember the scenes how my grandma used to prepare meals for us when she was still around. And now, I want my children to experience this awesome bonding that we have created. I want J and K to get to know and mix around with this extended family of mine. For many years since I got married, I had to go to my in-laws’ home during Chinese New Year for a few days. This year is different. I don’t have to “allocate” my time for them as my parents-in-law are away. So naturally, I have to stay at my mom’s home for the entire holiday. During the stay, one apparent thing happened. I noticed my children had developed a very close relationship with my brothers (their uncles that is). This time around, they took lesser time to “warm up” and they started playing with their uncles almost immediately after they met. This is despite the fact that J and K only meet up with my brothers just a few times a year (less than five). The relationships have never been so close. Apart from family gatherings, I also make it a point to visit my friends during Chinese New Year. With children around, I can’t beat the records of visiting 5-6 houses a day which I did when I was a student then. Now if I can visit 2-3 friends, I will be very happy. Other than cathching up with friends, I also take the opportunity to let my kids get to know my friends’ children. 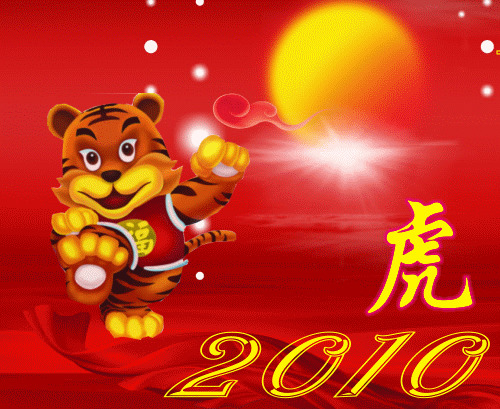 Happy Chinese New Year 2010!